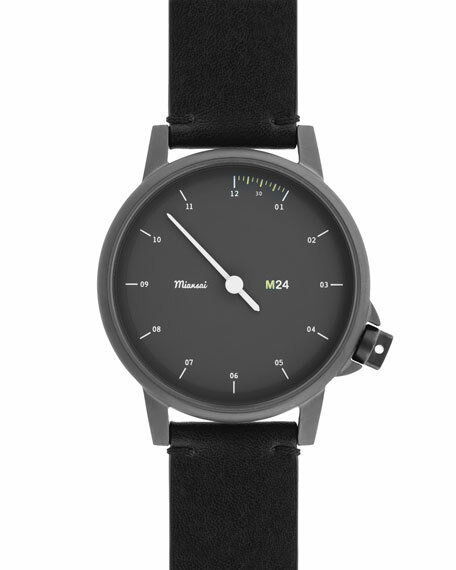 Miansai M24 watch with Italian leather strap. Stainless steel PVD-coated case; domed mineral crystal. Silver curved dial with hour markers. Miansai, the Miami-based handmade accessories brand, began with a single bracelet in 2008. Since then, Founder and Creative Director Michael Saiger has turned his vision into a timeless multi-category accessory lifestyle label. Miansai continues to evolve as a leader in fashion accessories while holding its reputation and customers in the highest regard. In addition to the personal attention each Miansai piece receives, they put the same amount of time and energy into sourcing the highest-quality materials. At their studio in Miami, they have invested in tools and machinery that allow them to produce product on a consistent basis with care and craftsmanship. From sketching to creating molds, melting metals and final assembly, every piece of Miansai jewelry that is conceptualized is created in house by skilled craftsmen and artisans. Fixated on quality and perfection, they take great pride in what they do. For in-store inquiries, use sku #710832.